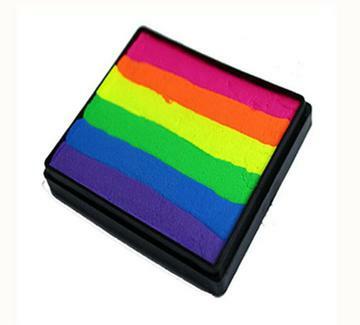 Exclusive Rainbow cakes are revolutionizing the way we paint it�is perfect for Halloween or�blacklight party's. Our UV body paint is excellent for any design. They can be used with a flat brush or sponge to create amazingly blended designs with one stroke. UV Neon Rainbow color combinations are designed to highlight and low light all with one container. Dip your brush in water and blot extra water from brush on a dry paper towel, next rub your brush back and forth across the surface of the UV Neon Rainbow. Make sure to load your brush equally on both sides of the bristles. For best results use a spray bottle to wet your rainbow cakes and rub a half sponge across the top of the rainbow cake. Make sure you are not using too much water or it will cause colors to blend and bleed into one another.